One of the last additions to the Sprinter van is a Fiamma F45S Awning. You can get them in various lengths and after a bit of back and forth we decided to go with the 13 foot (actually 13’1″, which is 4 meters) version. On a 158 wheelbase like mine you could go up to 15 feet but I wanted to avoid any overhang in the front. The above picture shows the awning installed (but not fully extended). Figuring out the maximum width available on the van is an art by itself: You not only need to consider where the awning will be located on the van itself but you also need to take into account where the (optional) wall mounts for the legs will be located. 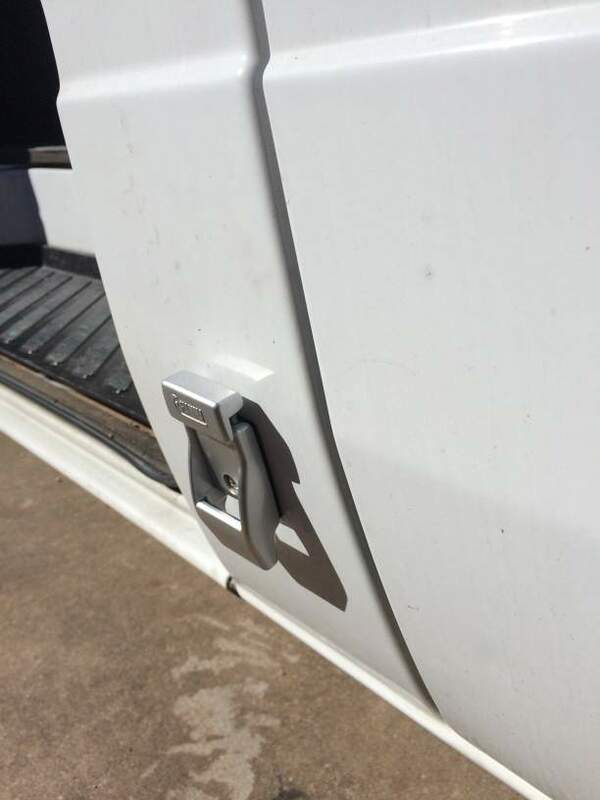 If you want the wall mounts, the front leg mount needs to be in the A pillar, otherwise you’ll end up with the mount either in the passenger door or the sliding door. Once you figured out the location of the awning you’ll need to find the best location for each bracket that holds the awning. Depending on the size of the awning you’ll have two or three brackets. You have some flexibility with the bracket location since you can move them back and forth in the channel they slide into on the awning. The installation manual is a bit confusing here. The drawing says that there should be an equal distance between the middle bracket and the other two on each end of the awning. However on the back of the awning itself there’s a sticker indicating the position for the middle bracket which is not in the middle of the awning itself. Don’t ignore this sticker! The reason why you’ll need to offset the middle bracket is simply because the rafter mechanism is smack in the middle of the awing. If you end up with your middle bracket here you can’t secure the bracket to the awning body. I followed the instructions and ignored the sticker – not a big deal because the two outer brackets hold the awning with screws in place and the middle bracket is still supporting the awning weight. I found it very easy to figure out the ideal spots for the brackets by marking the location of the points where you don’t want to drill into your van with painters tape. Next, figure out where the brackets need to go on the awning body and then measure the distance between them. 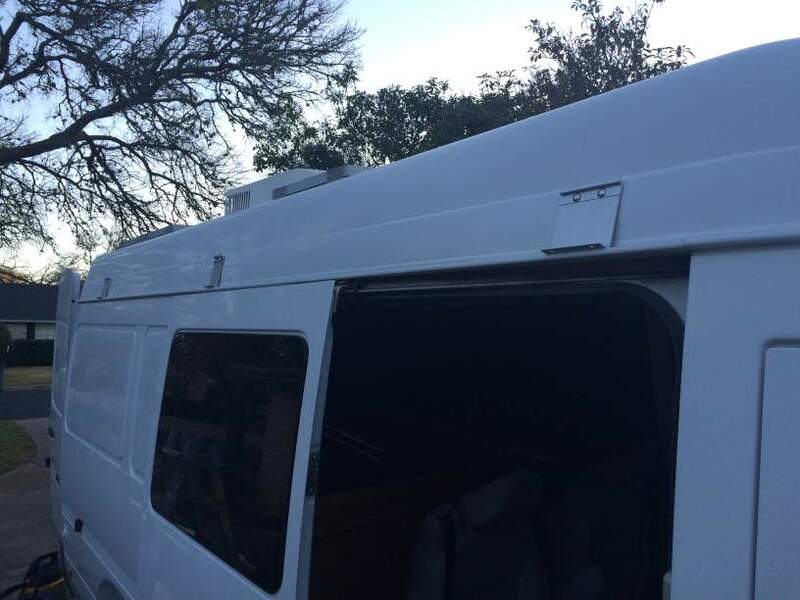 Start with the first bracket in the front and them simply use the same measurements from the awning to place the brackets on the van body. If you’ll end up with a bracket in a spot where you don’t want to drill (e.g. the enforced rib structure), just move the first bracket and start measuring again until you have all brackets where they need to be. 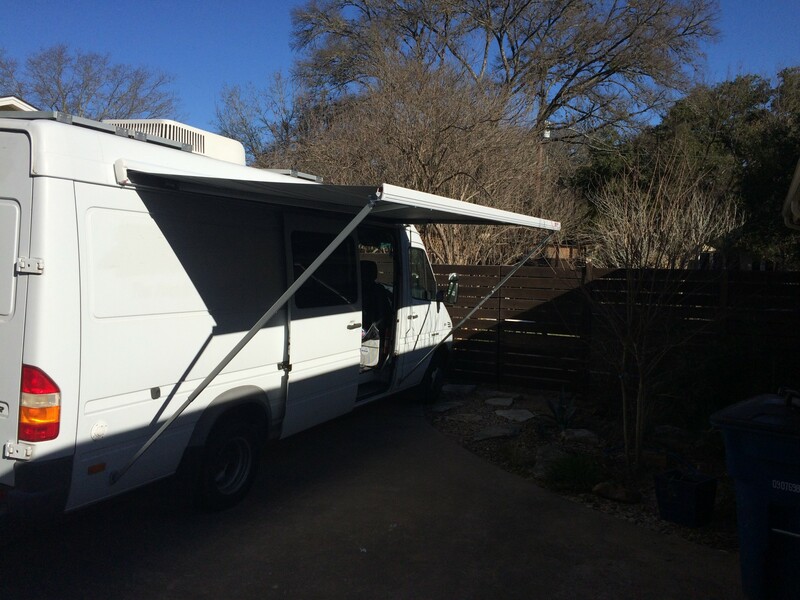 I installed the brackets so that they rest on the rain gutter – this helps to spread out the load of the awning. The brackets come with a mounting plate which goes on the inside of the van. As you can see on the picture the brackets are not level but angled towards the van. I’ve seen other people building adapters to reduce this angle and the Fiamma installation manual is recommending to use some spacers. The result is that in my case the awning pitch is not as it should be and I probably have less shade when the sun is low but being 6’5″ I actually appreciate not hitting my head at the awning all the time so all is good for me here. For the the final step you’ll definitely need helping hands. 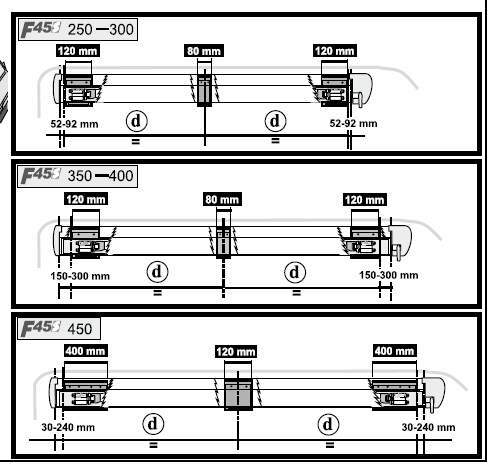 There is no way that you can lift the 60 pounds which the Fiamma F45s weighs and drop it into the three brackets. But it’s a very easy task for two people. The only thing left is to secure the brackets to the awning body with the screws that came with the Fiamma F45S. My Fiamma came with the wall brackets for the awning legs which allow you to use your awning on any ground. Simply roll out the awning and place the supporting legs into the wall brackets. Installation is pretty easy: Open the awning about a foot, drop the supporting legs and bring them close to the wall of the van body (a spirit level is helpful here). This is the spot where you mount the wall brackets. Fiamma F45S Awning. I got mine from Eurocampers – the prices are pretty much the same everywhere but I got lucky and found a 5% off coupon for this shop. Sound proof your wheel arches and reduce road noise! I too am mounting the 13′ F45S to a 158″ T1N and have a bracket mounting question. After measuring an ideal spot for the front bracket so the leg mounts to the A-pillar, the middle bracket measures out to be in the middle of a rib. Does the leg have somewhat of a wide pivot-range to move fore or aft when down? I’m contemplating moving the mounting forward to avoid trying to go through the rib. Thoughts? Hi Arthur – you can move the middle bracket to the left or right to find a better spot. The legs need to be straight, especially if you plan to use the wall brackets. If you happen to move the middle bracket to the spot where the rafter folding mechanism is located (like me) you can’t screw the awning case to the bracket but I don’t have any problems with just the outer brackets screwed into the case. the middle bracket is supporting the awning just fine. 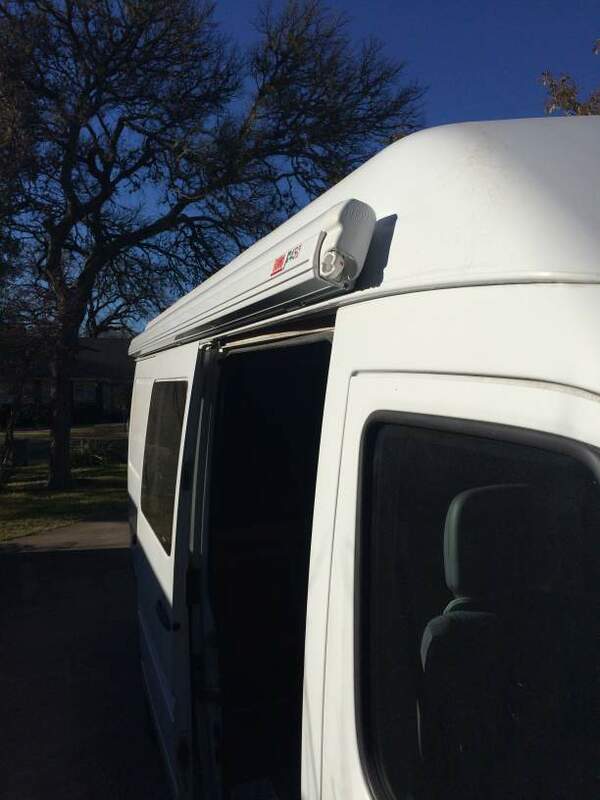 I’ve had a Fiamma F45S 10 foot awning on my ’88 VW Westfalia camper which I am selling, but I removed it to put on the ’06 Sprinter 2500 cargo,140 that I just bought and will soon be camperizing. Van cafe, one of the best VW shops installed the Fiamma on the Westy by mounting the awning clips directly on the van gutters. We also installed the wall brackets for leg support on uneven ground. The awning has worked flawlessly for several years. Looking at the Sprinter it looks like I could mount the Fiamma the same way, without drilling through the van itself or using the brackets you show. Have you seen that done or have any thoughts on it? i think you’ll run into issues as the gutters are too close to the door opening.